I am learning to think in layers of tiny lumber, like Basswood trimmed in skewers on the inside and outside of this shrine. The "studs" are Balsa wood, 1/16x1/4 inch. When I first started the project, I slathered Elmer's glue on everything and waited for it to dry overnight before going on to the next step. Yawn. I pondered why the videos and tutorials used Elmer's or wood glue and not hot glue which dries in a flash and reasoned that the hot glue was a bit uncontrollable for tiny gluing. But, this did not stop me. I used my hot glue gun to put together this altar. What a difference. 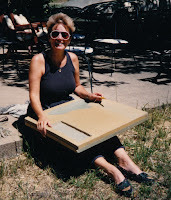 It went together in no time, is very sturdy, and allows me to keep going when I am on a tiny building roll and ready to finish the piece. It takes patience and finesse to keep from applying too much of a good thing but it is instant gratification. 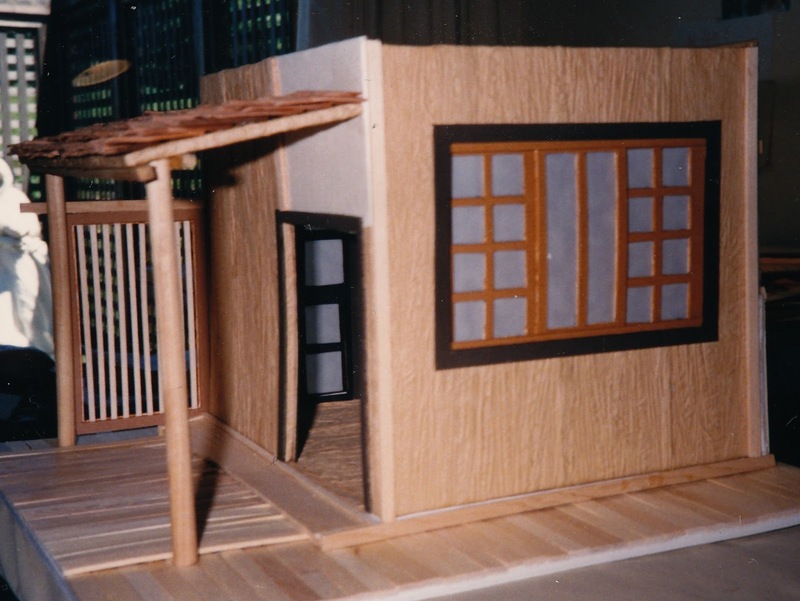 When I started this tiny construction project, I thought I was building a tea house. That's all. But, in my inimitable fashion, learning all about tiny construction while building tiny shrines has become a bit of a passion. My world of tiny construction opened up with a video of a contractor building a scale model of his home in 1/12 scale. The "Duh!" light bulb flashed above my head. Double wall construction. 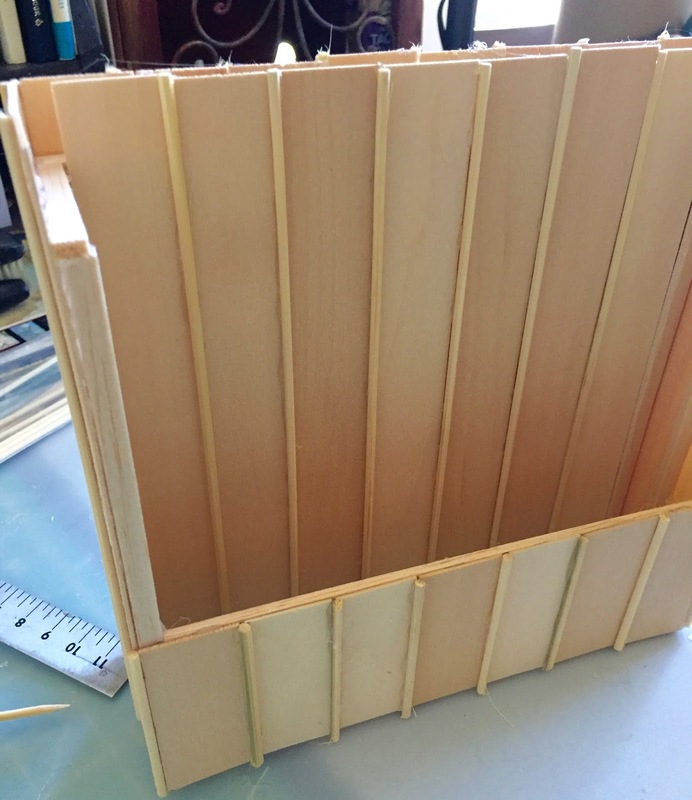 After building a scale model box (see previous posts about Double Wall Construction) I was ready to begin my first piece. 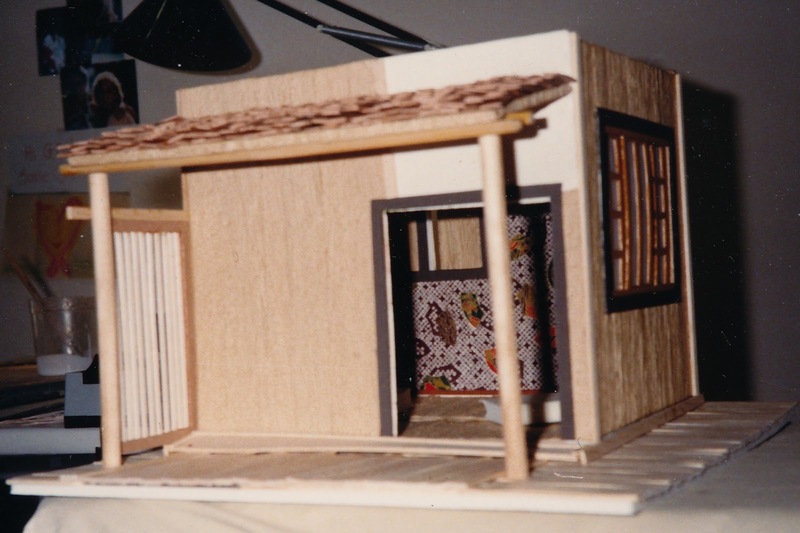 The first little tea house was built out of popcicle sticks and coffee stirrers. Also, I put it together with completely inadequate tools (Xacto knife, scissors) before the appearance of the tiny Xacto miter box and saw. I found the fabrics in a stash, a year after my first thoughts about curtains in a miniature tea house (see previous posts about the Japanese Tea House). 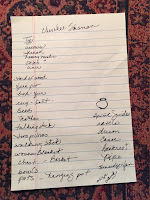 At that time, I was concentrating on the Faerie Project, which did not included a Japanese Faerie Tea House. This time around, those fabrics jumped right into my hands and said, "Now!" After exploring, and exactly following, the YouTube video about building a Japanese Tea House, I started to think about other tiny structures: shrines, temples, replicas of the tools and paraphernalia of the Divine. Which lead to the to the various divinities, temples, shrines and teaching which have influenced my life. I chose three such influences to start the project. Why three, Ginna? Can't you just do one at a time? Consider all that drying time. The three choices: a Zen Shrine, a Shaman's Tipi and a Rose Window. You'll hear plenty about the Shaman's Tipi and the Rose Window later, but here first is a series of photos about building the altar for the Zen Shrine. I chose to do the Zen shrine first to continue to hone my skills in tiny double wall construction. And, Zen Mind, Beginner's Mind, by Susuki Roshi of Tassajara Zen Center in Carmel Valley was one of the first spiritual books I ever read other than the Episcopal Book of Common Prayer. So, here is where I'll begin my series honoring higher consciousness and the divine. These plans for a Plains Indian tipi are printed across twelve 8.5x11 sheets of paper to make the tipi below at 1/24 scale. The interior is about 10 inches in diameter and the cone top is at about 15 inches. Notice how the front slopes, which is part of the elegant design to keep the smoke (emanating from the fire pit in the middle) moving up and out of the smoke holes at the top. The opportunities for making tiny things for a weenie tipi are endless, so endless, it kept me awake last night until I surrendered, turned on the light and scribbled all this down. Of course, a canoe. Any self-respecting shaman would have his own canoe. On the right are different sizes of paper tipis constructed while finding the proper scale dimensions. 1/24 means two feet per inch. I said this in an earlier post, but it's worth repeating that when we built Faerie Junction a year ago, the motto was, "Scale? Haha. Who cares? It's faeries! Just make it small." With this project, I am inclined toward accuracy. Accuracy not only in the dimensions of the temples and shrines, but also with regard to the creation of the tiny tools and paraphernalia of devotion. Watching glue dry causes a "get-it-done-now" girl much frustration. And, although my hobby motto is "No Hurry," I have chosen three very different cultural. i.e., devotional habitats to create in miniature to relieve me of boring drying time: the Shaman's Tipi, a Japanese Shrine and a Rose Window Screen. After I left Rainbow Ranch, the owner was none to happy with my donation of the tipi to the center, since it wreaked a bit of havoc by blowing into a tree in a storm. However, my memories of it are clear. And for me, the tipi of a shaman would be a holy place. If I have lived before, I have surely been Japanese. Long ago, when wondering why I put with with a rude design client who walked in front of me, I suddenly saw him as a 16th century Japanese Warrior, and I his wife, three paces behind. True or not, I honor Japanese design as well as the quiet calm of their devotions. Not to mention the most interesting roof lines. The Rose Window? I love the rose window. Three very different cultures and projects. But, imagine the tiny tools? More on that, next post. When cutting the siding for this little model, I overlapped the edge about 1/4 inch to make the siding meet at the edges of the box. The windows are trimmed inside and out. I added a tidy and stabilizing trim to each corner. 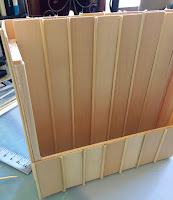 The trim boards are 1/4 inch taller than the walls in order to hold the roof, which will eventually be made when I figure out just what it is I've built here. Is it a Japanese Temple? Is is a Presbyterian Church in Tokyo? Is is a tower in an English woods? I traced out the wall covering on quilters' cotton fabric and glued it to all the posts, covering the individual walls. I added interior window frames before gluing the box together. I continually amuse myself by the mix and match of cultures and materials as I study this project, trying to make sense out of my Vision. 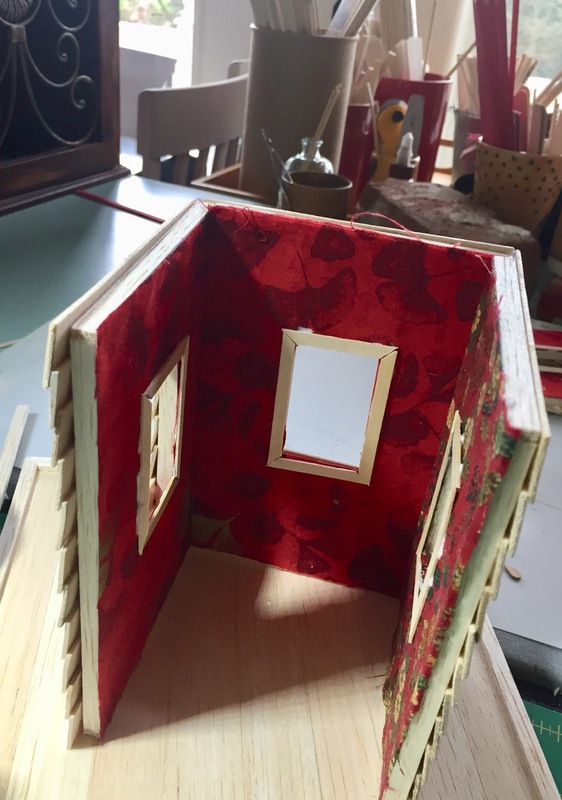 * The first tea house was fine, and I loved the little sliding shoji screen doors that actually slide, but the second attempt in red looks more like a barn than a Japanese shrine. And, the "stain" warped the craft sticks, so it's beginning now to look like a red outhouse in the backwoods of my home town. In this one, I am using Japanese fabrics on the inside while the outside is beginning to look like a 1920s protestant church. Would that be clapboard? 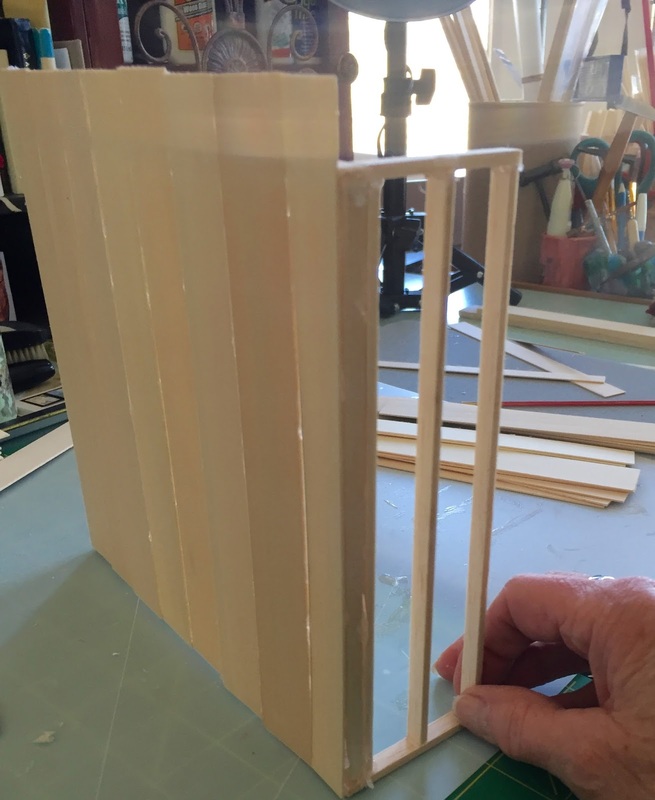 The miter box and tiny saw are essential for making these window frames, even though it takes patience to cut the soft wood without chewing it up. It takes more patience to wait out the gluing process. *As you might recall, The Vision began with some scraps of fabric. I thought they'd make a cute little curtain in a miniature Japanese Tea House. This turned out to be true. However, what was also true was the rest of The Vision which continues to grow. I find the materials easier to handle and definitely cleaner than dealing with gourds, which you have to grow, dry, clean and cut, and gourd dust is nasty and toxic. These sweet soft woods, on which I can use many of the tiny gourd tools, are very satisfying materials. Which leads me back to The Vision. The very fact that I love the materials leads The Vision on, with various names throughout the process, from Shrines for Humanity to Shrines to the Divine. 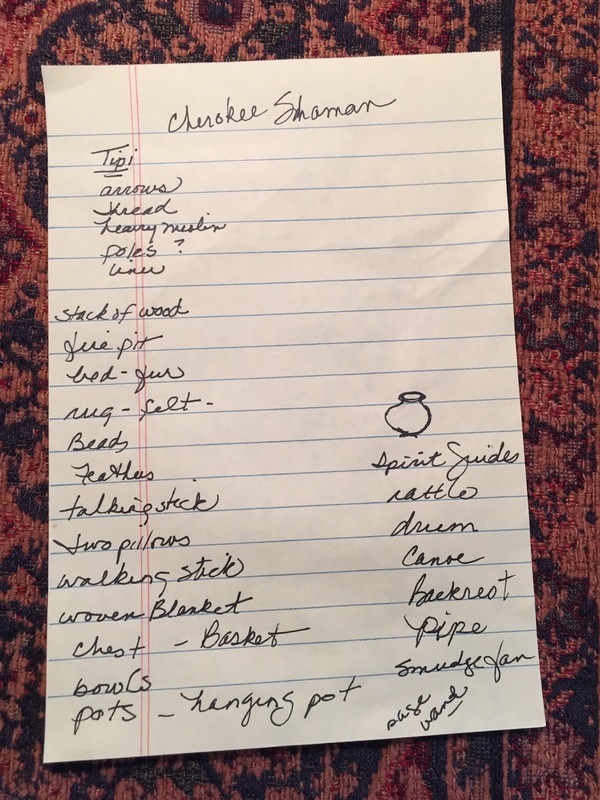 So far I have seen a tiny Shaman's Tipi, an Ornate Mosque, a Humble Chapel in the Woods, An Episcopal Steeple, A Shiva Shrine, A Tibetan Temple. I don't know where this will take me, but the journey certainly is fun. Pack a basket, bring the wine. We're on a road trip. This weekend, I learned how to do tiny double wall construction by watching a You Tube video of a man building a complete replica of his home. I used balsa wood trim pieces, although the ends are so soft the saw cuts look like a squirrel did the job, and, of course, craft sticks for the siding, only because I haven't found a decent replacement. For the future of this project, I can hardly see building Shrines to the Divine out of craft sticks. However, it did work for this siding, but I put a heavy weight (a covered brick) on the piece while drying to keep the siding from curling or warping. 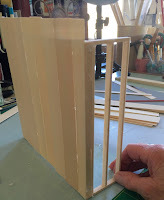 The hardest part about tiny building is all the waiting time while different elements are gluing. From now on I will have two or three structures going at once. 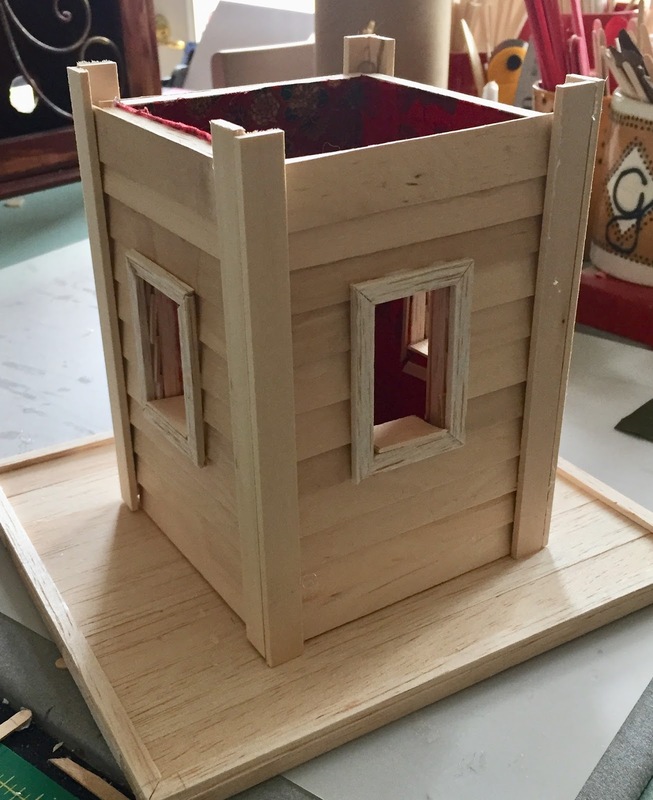 In the last post, I made the statement that everything I learned about tiny construction came from the YouTube tutorial I watched 25 times about building a Japanese Tea House. This is not true. Here are three photos from 1988 when I studied scale models with an architect in Sausalito. 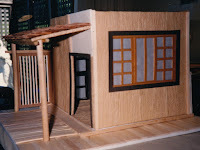 I did a wonderful job on this tea house model. I wish I could remember all the details. I do remember that the shoji screen windows do not slide. So some techniques have improved. I can also see that the flooring and possibly the siding are made from craft sticks, which I am losing interest in rapidly. Warping is the issue. Craft sticks are fine if you do not plan to paint or stain the structure.